A good teacher will make the difference between learning by discovery and learning by instruction as narrow as possible. In other words he will assist his students in their learning so that their experience will seem to them a discovery. Some great teachers really have this gift. Their classes are so good that you‘re constantly finding out new things and getting excited about them. The challenge and the enthusiasm of learning are kept alive by the evident love that these men have for their subject. The teachers cannot but communicate to their students who come out of the classroom with a desire to learn more. 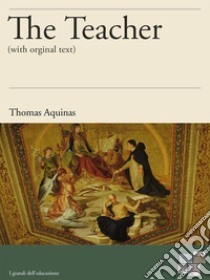 The St. Thomas teacher’s role is that of a physician ministering to a man brought down by an infection. In many such cases, if the patient went unattended, his body would mobilize its restorative forces and eventually heal itself. The art of the teacher is like that of this internist, since all the teacher can hope to do is to strengthen the student’s resources and facilitate their exercise. The import of the analogy is clear enough whether it is medically accurate or not. Whenever true learning occurs, its principal cause is the learner himself. In St. Thomas’s terminology the teacher is called a secondary and instrumental cause ?helpful but not indispensable. He cannot transfer his own knowledge to the student but only help him achieve similar learning for himself. It is the teacher’s job to provide the student with a good understanding of the first principles of matters. He will also help the student to sharpen his skill in solving problems by explaining to him the basic process when the pupil has a difficulty, he will give him examples, comparisons, schemas etc….which will be so many "pointers" leading the pupil to grasp this or that particular truth. When you are in front of a wall too high for you to leap, you may need the assistance of someone to point out a ladder which you had not seen. The teacher’s art consists in employing language so skillfully that his student will go beyond the words to the realities they signify.